Use only seafood that’s considered sustainable by industry experts? Create brand-new seafood dishes every single week, using obscure but sustainable fish, and get picky college students to eat them? And it’s one that chefs at University Housing & Dining Services are rising to each week, as part of a new program that adds weekly sustainable seafood dishes to dining center menus. Launched in September 2017, the sustainable seafood initiative adds to an existing program, Harvest of the Month, which highlights a particular type of local produce each month. Now, chefs are challenged to create dishes featuring a sustainable seafood of the month as well. Dining leaders point to the health benefits of increased fish consumption, as well as the positive environmental impacts of using sustainably harvested seafood, as benefits of the program. “By serving more fish, we’re serving less beef or other foods that may have a higher global impact,” Paterson said. The UHDS culinary team intentionally selected fish that are not common on U.S. menus. “We wanted something more than just salmon or fish and chips,” said Tara Sanders, Assistant Director for Nutrition and Sustainability with UHDS. Featured seafood so far this year has included Dover Sole, Atlantic Skate, and Wild Blue Catfish. February’s featured seafood is Pacific Northwest-grown mussels. UHDS dining leaders invited university chefs to try test a dozen varieties of fish before selecting types to feature this year. All fish selected are rated a “Best Choice” or a “Good Choice” by Monterey Bay Seafood Watch, or by the National Oceanic and Atmospheric Association’s Fish Watch program. The team also considered price, availability, and flavor profile when making their selections. Some featured fish are local, while others are varieties that are under-utilized when compared to more familiar species like tuna or cod. “We really wanted to challenge our chefs,” said Jaime Hererra, Executive Chef for University Housing and Dining Services. As a result, members of Beaver Nation are discovering that they like more kinds of fish. In November, Marketplace West Chef de Cuisine Bruce Hoerauf created a dish featuring skate roasted with fennel and onions. Skate is an Atlantic white fish with a delicate flavor, but it’s not familiar to many American diners. Despite that, students, staff, and faculty alike tried it. One guest ordered it, then liked it so much that he came back and bought three more portions to share with his office-mates, Sanders said. That’s exactly the kind of result UHDS is hoping for, according to Hererra. “This is an educational vessel for us,” he said. Featured sustainable seafood specials are available every Wednesday, at every dining center on campus. Look for signs that say “Harvest of the Month” to discover dishes featuring both the vegetable of the month and the seafood of the month. 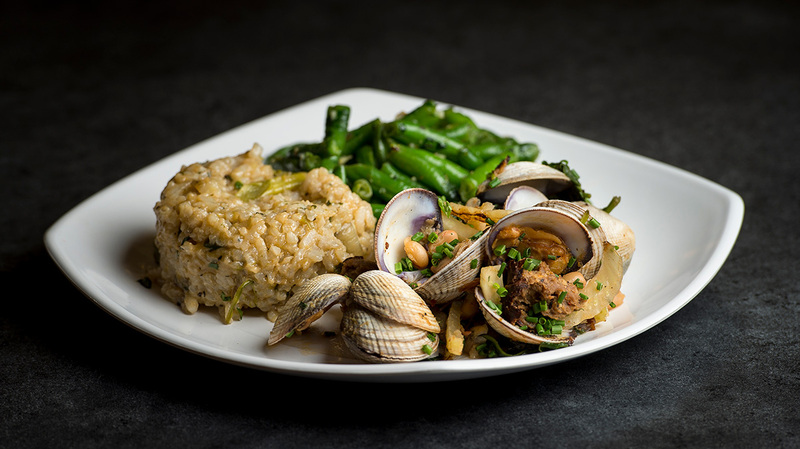 Ultimately, leaders say, they want the widened seafood palate to become common for chefs and customers alike. “We hopes this expands more seafood into the usual menu flow, so that we get unusual suspects popping up on a regular basis,” Hererra said. Learn more about University Housing & Dining Services’ commitments to sustainable food sourcing. Check our weekly menus to see what’s offered at campus dining centers. Learn more about Monterey Bay Seafood Watch and NOAA Fish Watch ratings.